Explore Gettysburg by horseback and the Civil War trail through Pennsylvania with kids for an education vacation. I am planning to bring my son to Gettysburg and other historical sites after he turns 8 this fall. 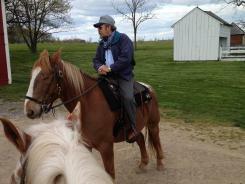 When I found this article: See Gettysburg battlefield by horseback – USATODAY.com, I thought this sounded like a great way to really get a feel for the history that took place here! A twig snaps and brush rustles in woods on the Gettysburg battlefield. My horse does not flinch. It’s nothing more than a small animal scurrying away. But on a hot summer day nearly 150 years earlier, it could have been the enemy. The author and her family toured the battlefield and surrounding area with a licensed guide on horseback and had an unforgettable experience. With the 150th anniversary of the Civil War this year, a family road trip following the Civil War Trail (click here for a map by USA Today Travel) through Pennsylvania can bring history to life for kids. There are a few theme parks along the way (Hershey Park -chocolate themed in Hershey -near Harrisburg, Zoo America -zoo in Hershey, and Dutch Wonderland -an Amish-themed amusement park in Lancaster) to keep their interest, too. If you are headed to this area, check out our great deals on family hotels in Hershey, Gettysburg, and more, and enjoy our 110% Best Rate Guarantee! If you’ve been here before, please share your tips in the comments below!